For the final type of layout we come to "Spanwise." This typically had the factory edges running parallel to the leading edge of the wing surface. This was thought to be the result of in the field or at the depot repairs. This assumption goes back to the time when Albatros D.Va 5390/17 was being recovered in Austrailia post 1918. There was strong evidence that the two toned camouflage was an "in the field repair" as the colours were several shades out of tune with standard German camouflage. When the overpainted fabric on the wings was removed it was found to be 5 colour lozenge applied spanwise that had been overpainted. So along with mismatched serial numbers on the wings it was assumed that during its operational life D. 5390/17 had it skeletal wing structure replaced or repaired, recovered and repainted. Or it may be that the replacement wings were all simply overpainted to keep the camouflage uniform in appearance. This "Spanwise" layout was probably easier in the field at repair facilities where getting the machine back on the inservice list was paramount. It may depend on time or equipment contraints (sewing machines) but in either case it was done. There is some thought that this was done at the factory on a select few machines, all from production batch Alb. D.Va 5375/17 to 5399/17. Here you can see my build of D.5390/17 and note the under surface of the top wing shows it to be 5 colour lozenge. Also the upper surfaces of all wings were overpainted in the field. By the way this machine was involved in one of the most bizzare dogfights of the war. An Eerie tale that sends the more squeemish screaming into the night. Betcha think I am finished eh? Sit back down in those lounge chairs folks and slap on another coating of sunblock we have a bit more to cover. But before I continue...Are there any questions? Next we will discuss the various types of lozenge day and night versions. This question might be off topic. 1) If say an aircraft came in for repairs and needed to be recovered on the upper wing which had a 5 color lozenge, 45 degree application. Would it always be repaired in the spanwise manner - since it seems to be the easiest. 2) If an aircraft needed recovering and had 5 color lozenge, but only 4 color was on hand would a) the whole aircraft be recovered or b) there be possiblities of 5 color on upper wing and 4 color lower wing - different combinations in other words? 3) On a spanwise application, are the ailerons matched in to the rest of the application or are they whatever? Great job on the subject!! Absolutely marvelous! Sorry for my despairing "Haven't had a chance to look..." PM last week. A week already? I still can't keep up, but seeing stuff like this is the best medicine I can take to see me through a heavy period at work! Of course, being off-line just gives me time to think up loads of new WW1 "How-To"s for you... you did want to know that, didn't you! Again it depends on the man-power available to do the work, equipment and the general need for aircraft at the time. During an offsensive we can only guess. 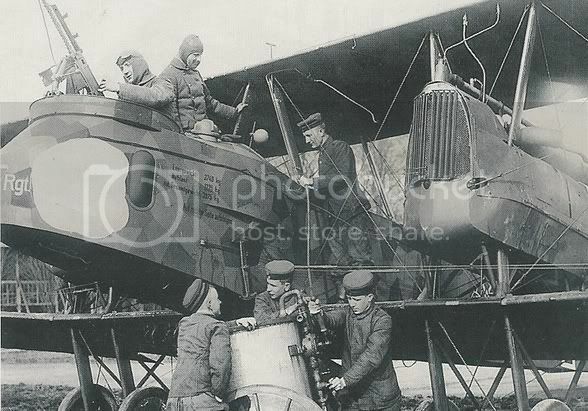 In late 1918 men were transferred to the front from aviation units to meet man power requirements. The real key is to have photo references for specific airframes. In some cases at the unit level and at the air park depots whole wings were swapped out. Yes an airframe could be seen with mixed camouflage treatments. Here is the Jasta 43 machine. Here is the Jasta 46 machine. The pilot of this aircraft is unknown but it was photographed in British hands post war. The lower wing crosses should be further out by one half of a rib space. There is evidence that the unit may have had red or black forward fuselages. The top wing is in 5 colour lozenge while the bottom wing is in four colour. Ailerons were always done in spanwise layout no matter what the wing layout. I am very glad that it helps answer your concerns. Work, work, work, work, work. . . Here France's top ace Lt. Jean-Luc Georges Charles Tedemere-Formery displays his most recent trophy. The vertical tail unit of a DFW C type in night lozenge colours. Figure and tail unit are Copper State Models items. 1.Five color upper day pattern very dark. 2.Five color upper day pattern dark. 3.Five color lower day pattern. 4.Five color overall night pattern. 5.Four color upper day pattern. 6.Four color lower day pattern. 7.Three color Naval printed fabrics. On several different aircraft in 1917, the Item 3, five color lower pattern fabric was used as a top fabric with plain unprinted linen used on the under surfaces. Item 2 above, was used on most aircraft in 1918 as a top fabric with item 3 lower printed fabric. During his study of fabric sample from German aircraft, he found the fabric distorted, so he measured fabric samples. Prior to any measurement being made he squared the sample on a drawing table to put the fabric sampled into the condition as it was when woven and printed. The purpose was to ensure the shape and location of the polygons were correct. He made 1/12.5 scale patterns and full size patterns of the four and five color patterns. The polygons on the five color pattern were identified A through E,and 1 through 4 on the four color pattern. Item 1. Five color day upper pattern, very dark. Item 2. Five color day upper pattern, dark. Item 3. Five color day lower pattern. Item 4. Five color all over night pattern. 1. Dark violet 17F3/4 which is virtually black. 2. Dark blue, 20F3 to 21F4 also virtually black. 3. Dark green, 27F3 to 30F4 " " "
Note painted not printed fabric. I have two questions though to you. 1: In the case that you did repairs out at the front units, how was the delivered to you? In rolls or were they delivered as pre-cut units for you to just put in place? 2: Was there ever a winter version tested or planned of the Lozenge? Looking forward to more matey! 1: In the case that you did repairs out at the front units, how was the fabric delivered to you? In rolls or were they delivered as pre-cut units for you to just put in place? Thanks for the support. I had hoped to be able to give everyone a good basic understanding. 1.The repair stores had to be delivered in small rolls. Every wing configuration had differing areas. Precut sections would have proved useless. 2. There was not a winter scheme of lozenge. From the venerable Dan San Abbott, here is a bit more on the specific factories that used what appications. Note the term bias is meant to decribe the factory edge to factory edge unions of fabric bolts layed out at the 45 degree angle. "...Almost all German aircraft factories used the chordwise method of covering wings. The Halberstadt, DFW and Siemens Schuckert used the bias (angled) covering method with the warp yarns (seams) at 45 degrees to the leading edge. DFW built DFW C.V were bias (angled) covered on all their orders except Aviatik built, serial numbers DFW C.V (Av) 5825/16 to 5974/16 and all subsequent Aviatik built machines through serial DFW C.V(Av) 8249/18. It is my understanding that bias (angled) wing covering were used on wings where wing warping was used for (lateral) roll control..."
In the next few days I will continue discussing the chordwise application of the Eduard lozenge and show the various methods that can be used. I'm ready young Master Stephen! Then here is a bit of homework. Study the two images and their information. Be ready for a quiz. The Methuen Code of colors, has it been translated into any model paint line? I would like to add that the the panel orientations were alternated. Especially with the OAW airframes. That is panels were turned 180 degerees from the next that it was joined to. The red arrows show the panel seams. The yellow arrows show the same lozenges on each panel as they oppose each other because the panels are at 180 degrees. The Methuen Code of colors, has it been translated into any model paint line? Thanks again! Greetings Hunter Cottage,There are several paint companies that have what they call WWI colours. I prefer to mix mine as I can get closer to the colour I am looking for. In the first image here note that looking from left to right, the 2nd, 4th, & 6th arrows are on seams that are of a similar pattern as the real wing image (with the red and yellow arrows) in the 1st, 3rd, & 5th seams. The small "diamond shaped" green lozenges are the key to telling you that; in the real wing image it employs 5 colour camouflage. The undersurface patterns are identical to the upper surface but the colours are more pastel in nature. Again we are just focusing on the Eduard brands for now. Now to be fair I'll take questions before I offer the quiz question. Ok, no questions. So either we are clear on everything up to now or no one wants to speak up. I'll go with the first option. So far we have discussed the basic application of lozenge camouflage to wing panels and their locations on a basic single seat fighter wing. I have also shown you a typical application of lozenge fabric to a single seat fuselage. Some two seater manufacturers are noted for using the lower surface pastel colour lozenge on the upper surfaces. Then they would use plain clear doped linen or that with a lt. blue overpainting for the undersurfaces. My own personal opinion was the availability of certain camouflage stocks determined what could be used to complete a specific contract order. The moral of this story is always use good reference materials and images. If you care to do it right use good reference materials. Now that we have discussed the basic applications and potential variations we will contiue on with rib tapes in the next chapter. But first, Here is a bit of fun. Question: Aside from the basic colour issues of the Eduard 4 colour 1/48 scale lozenge, what is the one problem I spoke of that is apparant only to the trained eye? I would venture it is the direction of the fabric, what we have come to know it as "angle of thrust" or "key lozenge". Nice try Hunter Cottage. But the thrust angle is a normal development of the pattern that the colour assignment lozenges are laid down at. I was looking for a problem or an error with the Eduard 4 colour lozenges. You said there were two colors swapped. Can't remember off hand which ones.